Uranium deposits are generally classified based on host rocks, structural setting and deposit mineralogy. Learn more about them here. Uranium is one of the more common elements in the Earth’s crust — it is often said to be some 40 times more common than silver and 500 times more common than gold. Uranium ore deposits are found globally, with the largest-known recoverable resources found in Kazakhstan, Canada, Australia and South Africa. The metal is so abundant that it can be found almost everywhere, including soil, rivers, oceans and rocks. The challenge, however, is to find areas with concentrations adequate enough to form an economically viable deposit — or, better yet, a world-class deposit. Uranium ore is mined in several ways, depending on the geological conditions; processes include open-pit mining, underground mining, in-situ leaching and borehole mining. Once extracted, uranium ore is crushed and rendered into a powder, then leached with either an acid or alkali. The leachate is subjected to one of several sequences of precipitation, solvent extraction and ion exchange. The resulting enriched mixture, called yellowcake, contains at least 75-percent uranium oxide. It is then calcined to remove impurities from the milling process before refining and conversion. Canada was once the world’s largest producer of uranium, but has been overtaken by Kazakhstan. That said, the highest-grade uranium deposits are in Canada’s Athabasca Basin in Northern Saskatchewan. The largest uranium-producing mine in the world is Cameco’s (TSX:CCO,NYSE:CCJ) McArthur River, an underground mine located in the Athabasca Basin; however, it is now on care and maintenance. Uranium deposits are generally classified based on host rock, structural setting and deposit mineralogy. The most widely used classification scheme was developed by the International Atomic Energy Agency with the objective of subdividing uranium deposits into 14 categories arranged according to their approximate economic significance. We outline these uranium deposit types below. Unconformity-type deposits are one of the most discussed uranium deposit types, and for good reason — they can be some of the largest and richest deposits on Earth. Relative to other uranium deposits, unconformity-type deposits tend to be the most high grade. They occur in close proximity to major unconformities between relatively quartz-rich sandstones and deformed metamorphic basement rocks. The most significant area for this style of deposit is currently the Athabasca Basin. Cameco owns and operates two of the highest-grade mines in the world, McArthur River and Cigar Lake. Also working on an unconformity project in the Athabasca Basin is exploration-stage Fission Uranium (TSX:FCU) with the Paterson Lake South uranium project; it hosts the Triple R deposit. Sandstone uranium deposits are contained within medium- to coarse-grained sandstones located in a continental fluvial or marginal marine sedimentary environment. Sandstone deposits constitute about 18 percent of the world’s uranium resources and are commonly classified as low to medium grade, in the range of 0.05 to 0.4 percent; individual orebodies are small to medium in size. Sandstone-hosted uranium deposits are widespread globally and span a broad range of host rock ages. Some of the major provinces and production centers include: Wyoming, New Mexico, Central Europe and Kazakhstan. Significant potential for sandstone deposits remains in those regions, as well as in Australia, Mongolia, South America and Africa. Quartz-pebble conglomerate uranium deposits were historically significant as the major source of primary production for several decades following World War II. This type of deposit has been identified in eight jurisdictions around the world; however, the most significant deposits are in the Huronian Supergroup in Southern Ontario, and in the Witwatersrand Supergroup of South Africa. These deposits make up approximately 13 percent of the world’s uranium resources. Vein deposits exist where uranium minerals have filled in cavities such as cracks, veins, fractures, breccias and stockworks associated with steeply dipping fault systems. These deposits are responsible for the term “pitchblende,” which originates from German vein deposits mined for silver in the 16th century. F.E. Brückmann made the first mineralogical description of the mineral in 1727. The first industrial production of uranium was made from a vein deposit in the Czech Republic, and Marie and Pierre Curie used tailings from the mine for their discovery of polonium and radium. Olympic Dam is one of the world’s largest orebodies. Located in Australia’s Gawler Craton, it is also one of the world’s biggest deposits of copper, gold and uranium, and has a significant deposit of silver. BHP Billiton (ASX:BHP,LSE:BLT,NYSE:BHP) owns Olympic Dam, and along with the Carrapateena mine it occurs in a hematite-rich granite breccia complex that is overlain by approximately 300 meters of flat-lying sedimentary rocks of the Stuart Shelf geological province. Olympic Dam is reportedly the only iron oxide-copper-gold (IOCG) deposit known to contain economically significant quantities of uranium. Intrusive uranium deposits make up a large proportion of the world’s uranium resources and are associated with a number of rock types, including alaskite, granite, pegmatite and monzonites. Major world deposits are found in Namibia, Greenland and South Africa. Low-grade concentrations of notably large uranium deposits can be found in marine sedimentary phosphorite structures, ranging from 0.01 to 0.015 percent U3O8. Very large phosphorite deposits occur in Florida and Idaho in the US, as well as in Morocco and in some Middle Eastern countries. Collapse breccia pipe deposits occur within vertical, circular solution collapse structures formed by the dissolution of limestone by groundwater. Resources within individual pipes can reach up to 2,500 tonnes of U3O8 at an average grade of 0.3 to 1 percent. The best-known examples of this deposit type are in Arizona, where several of these deposits have been mined. The principal uranium mineral in volcanic deposits is pitchblende, which is usually associated with molybdenum sulfide and minor amounts of lead, tin and tungsten mineralization. The average deposit size is rather small, with grades of 0.02 to 0.2 percent U3O8. These deposits make up only a small proportion of the world’s uranium resources. Currently, the only volcanic-hosted deposits being exploited are those in the Streltsovkoye district of Eastern Siberia. Surficial deposits account for approximately 4 percent of world uranium resources, and are interbedded with sand and clay, usually cemented by calcium and magnesium carbonates. These deposits may also occur in peat bogs, karst caverns and soils. The Yeelirrie deposit in Western Australia is by far the world’s largest surficial deposit, averaging 0.15 percent U3O8. Metasomatite deposits consist of disseminated uranium minerals within structurally deformed rocks formed from geochemical processes. Uranium content is very low, on average less than 0.005 percent U3O8. These deposits are typically small in size, containing less than 1,000 tonnes, and currently do not warrant commercial extraction. When uranium occurs in lignite, a type of coal, it is with mineral detritus such as silt or clay, and is found immediately adjacent to carbonaceous mud and silt/sandstone beds. Pyrite content is high in these deposits, with examples being present across the globe. Most uranium in this type of deposit is currently not economic. Black shale uranium deposits include large, low-grade uranium resources. They form in submarine environments under oxygen-free conditions. Because of their low grade, almost no black shale deposit has ever produced significant amounts of uranium. There is one exception: Germany’s Ronneburg deposit. Production between 1950 and 1990 was about 100,000 tonnes of uranium at an average grade of 0.07 to 0.1 percent. Measured and inferred resources containing 87,000 tonnes of uranium grading between 0.02 and 0.09 percent remain. Which uranium deposits are you most interested in? Tell us in the comments. Securities Disclosure: I, Amanda Kay, hold no investment interest in any of the companies mentioned in this article. 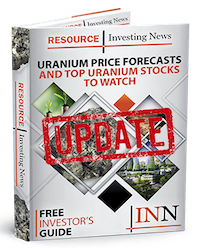 Get the latest information about companies associated with Uranium Investing Delivered directly to your inbox. Some quick comments on your article “world-clas uranium …” :you are using an old classification, for example “vein-type” does not exist anymore. An updated classification of uranium deposits has been presented and adopted by the IAEA in 2013. This classification is also officially used in the Red Book 2014. Metasomatite deposits are producing about 1000 t per year in Ukraine and are for some of them world-class resources in Ukraine and in Russia (Elkon District). I am collaborating with the IAEA for several years (classification of deposits, UDEPO Database, technical reports, …..), thus if you need any recent information which might be useful for your articles, do not hesitate to contact me.